I like the Twilight series. Yes it is very teenage girl of me but dammit I LOVE a good love story! I read the books long before the movies were even in the works and it definitely brings out the romantic/sappy side of me. I'm not a "twihard" or anything but Edward and Bella's seemingly perfect (but complicated) story just touches a little (alright a big) part of my heart. So sue me! I am a romantic =) I wish I had my very own Edward but I guess my boyfriend will do LOL. 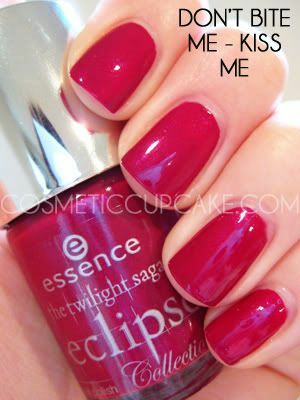 I FINALLY got to see Eclipse today and I wore one of my swap acquired Essence Eclipse polishes in honour of the movie. The Eclipse collection was such a huge lemming for me and I didn't think I would ever own them. I am most grateful to Tina from Fleur's nails&stuff for hunting them down for me and including them in our swap =) My boyfriend thought I was totally mad when I told him I HAD to wear an Eclipse polish to see it but I thought it made total sense! Plus I think he was just being mean because I forced him to come with me and therefore he had to sit through 2 hours of Robert Pattinson being all broody and seductive HA. I wore Essence Don't Bite Me - Kiss Me as my NOTD. Please excuse the quality of the mani - I did it literally 20 minutes before rushing out the door to watch Eclipse! Don't Bite Me - Kiss Me is a berry polish with purple shimmer. Berry shades are one of my favourites =) It applied relatively well but was a little on the thick side. I did 2 coats for opaqueness and it dried to a semi-matte finish so I topped it off with a coat of Seche Vite as I was in a mad hurry. The colour really reminds me of Orly Once Upon A Time (which you can see in my post here) but with less shimmer. Hope you guys are having a great weekend! Don't forget to enter my 200 followers giveaway here! @Nikki: It is a very pretty polish, I adore plum shades and with shimmer too! I'll post up swatches when I can definitely =) I'll be posting up more swatches from our swap soon too! 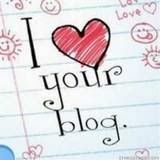 @PetiteLittleGirl: Thanks hun =) I look forward to your review on Monday! @Tassa: Glad you like it Tassa! I love the swatches you did, this was the only colour you didn't swatch! @Agnes: Ah thanks Agnes! You should try reds anyway! No worries at all and no rush, use them when you can =) Hope the wedding is fun! @Sydney: Thank you for the kind comment =) Thanks for stopping by my blog and commenting too! @Cecilia: Wow can't believe it's so popular! WOW this is soo pretty!!!! I seriously would buy this shade!!!! I like this color. It's so pretty!! @Joan: It's prettier in person actually!